Former University of Louisville basketball player Brian Bowen II has filed a massive federal lawsuit against Adidas, former Adidas employees, NBA agent “runner” Christian Dawkins and others. The Complaint, filed in the U.S. District Court for the District of South Carolina, is eighty-three pages in length and includes four different counts for violation of the Racketeer Influenced and Corrupt Organizations Act (RICO). Bowen claims that the acts of the defendants, described as a “criminal scheme directed by Adidas and its lieutenants,” caused him to lose his eligibility to play college basketball, forfeit financial aid and prevent him from developing physically and athletically into an NBA draft pick. Bowen claims that Adidas profited by exploiting players’ images and likenesses to consumers who would then be more prone to purchase Adidas products. The athlete advisors (Dawkins and Sood) allegedly benefitted by gaining leverage over the recruits by using their association with Adidas and AAU basketball participants, ultimately improving the likelihood that players would sign with them. The names Gatto, Code and Dawkins should be familiar. Gatto was Adidas’ Director of Global Sports Marketing – Basketball, Code was a consultant for Adidas and Dawkins was an athlete advisor. They were each arrested and charged in a criminal complaint in September 2017 and were recently found guilty on wire fraud conspiracy and substantive wire fraud. That criminal case is very closely associated with the new civil lawsuit brought by Bowen. In the criminal case, prosecutors alleged that Adidas employees worked in connection with corrupt advisors to funnel bribe payments to high school athletes and their families in order to secure their commitments to attend Adidas sponsored universities. In his civil case, Brian Bowen II will be tasked with meeting the required elements of a RICO claim, which includes proving that the enterprise he described was engaged in a pattern of racketeering activity. Bowen blames the defendants for defrauding him by depriving him of significant and necessary information regarding their actions taken that destroyed his NCAA eligibility, among other claims. He says that he had no knowledge of any bribery scheme when he committed to Louisville. That bribery scheme consisted of $100,000 being provided to Bowen’s father, that was designed to be concealed, in exchange for Bowen’s commitment to Louisville. The Complaint alleges that monies were also laundered through AAU basketball teams by the enterprise and that the Karolina Khaos AAU team was used as a passthrough in Bowen’s case. Bowen believes this was done with the intent of avoiding tax liabilities. Bowen’s lawsuit has the potential to further muddy the waters of the NCAA. In the middle of his Complaint, he says that he believes that the revelations from the criminal prosecution against Gatto, Code and Dawkins “have only scratched the surface of Defendants’ criminal conduct — and that of the entire sneaker industry” and promises to conduct discovery to learn about the extent of the “illegal scheme” perpetrated on Adidas’s behalf. 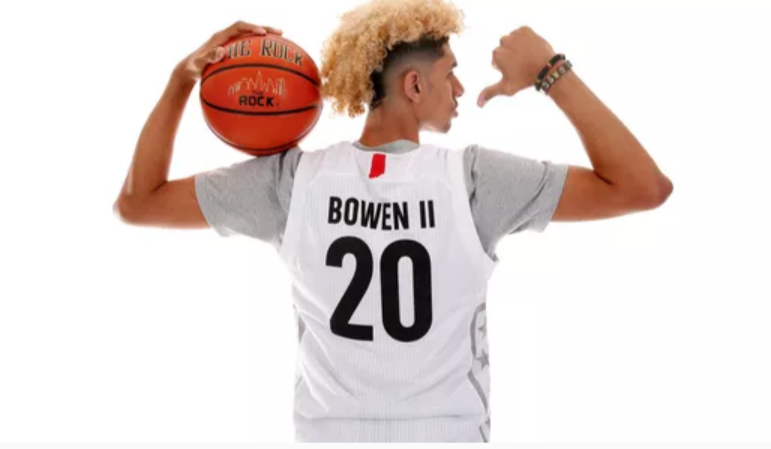 For now, Brian Bowen II wants relief for himself based on the loss of his eligibility to play collegiate basketball, suspension from Louisville’s basketball team, lost scholarship, lost opportunity to enter the NBA Draft as a highly touted prospect and more. He asks for attorney’s fees and costs as well in his prayer for relief.